Cletop “S” fibre optic connector cleaners have an easy to replace “drop in” tape cartridge rather than the reel on the original Cletop. A large majority of fibre faults are caused by un-clean connectors, which makes Cletop fibre optic connector cleaners essential items. NTT-AT’s optical connector cleaners use microfiber cleaning cloth which is soft and will not easily scratch yet effectively absorbs dust and residue. From skin oil residue to dust, there are many kinds of contaminants. NTT-AT’s CLETOP fibre optic connector cleaners provide the perfect solution to clean contaminants. 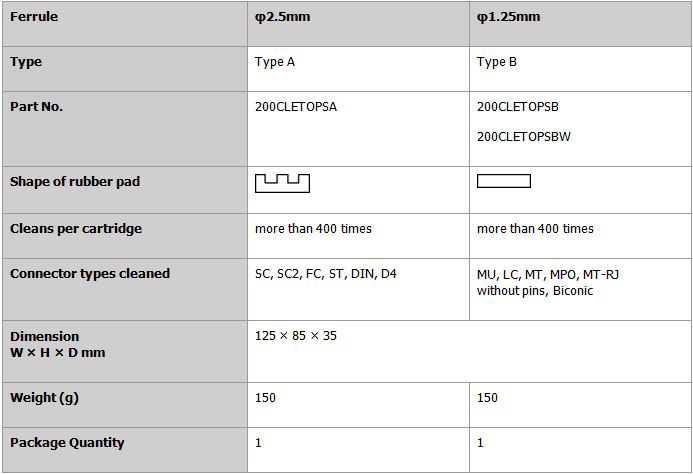 Cletop S Type A and Cletop S Type B fibre optic connector cleaners differ by the shape and density of the rubber pad below the tape. Also the tape opening size differs. This is to ensure the cleaning tape has full contact with the connector surface and to prevent the tape from tearing when pressure is used on the connector. Designed so that all operators can consistently achieve high quality cleaning without alcohol or other solvents. Palm-sized and lightweight. Easy and safe to use whether in the engineering lab, on the production line, or in the field. One cleaning tape can be used for over 400 wipes. Has excellent anti-static properties to avoid reattachment of dust to the ferrule after cleaning. To ensure consistent high-quality cleaning performance, it is recommended that the authentic CLETOP replacement reel be used. Do not use this product for other purposes than cleaning ferrule end-faces. The cleaning performance may change depending upon the environment and contamination types.